It's a whole 'nother ball game. Every gun law in the state, word-for-word and in plain English. See the changes for the past 15 years here. includes every update since 1989! All new laws from 2012–2014 (the last blue book, with the state flag on the cover). Constitutional Carry in 2010 changed so much. you needed permission slips to carry discreetly. Government control of trainers and schools has ended. The self-defense laws have improved by a lot. The effect of Heller and McDonald cases are described. The Militia provisions from the state Constitution are now in the statute section. States' rights, aka federalism, is covered, a look at the Art. VI supremacy clause vs. the Tenth Amendment. Fireworks, a gunpowder toy and loosely related to 2A and now legal in the state, covered in detail, with the statutes word for word. Half a dozen penalties have changed, mostly up for serious crimes (e.g., terrorism goes from class 3 to class 2 felony), and down for paperwork offenses, like not having you permit while in a alcohol-service place that honors CCW (from class 1 misdemeanor to $300 max fine only, reversible by showing papers at court; Any possession in a bar now a class 3 misdemeanor.). Kids' punishments have changed. A path for restoration of gun rights for overcoming certain medical disabilities. Possession by minors: It's a whole new world. We now have three classes of youngsters: 14 – 17, under 18, and under 21. For the youngest group, there are time slots only. Various arrangements of accompaniment, notes from parents, methods of carry, fines, driver's-license suspensions, possibly the most convoluted laws on the books today. In plain English in the new edition, of course. Too much freedom for some? 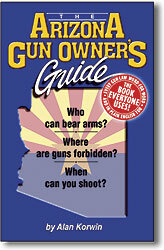 : Arizonans enjoy non registered possession and ownership of arms (with severe penalties for criminal acts of course); Discussion of registration schemes and their lack of a crime-fighting component; lists of the innocent leave criminals unaffected, at great cost. NICS and CCW stats updated. 100 million plus NICS gun checks in 13 years. What does that say for the total number of guns in the country? Preemption has been overhauled. The law has been amended so many times it's hard to keep track. The total effect is excellent protection from lower government meddling in gun rights. Described here in its entirety for the first time. Rules for kids are affected under preemption too. Parks and Preserves are no longer banned. It was pure joy eradicating those tired infringements from the text. Gun Lockers and checking is finally straightened out, with no registration schemes allowed, easy access required, definitions tightened to prevent government wiggling. But expect some wiggle. 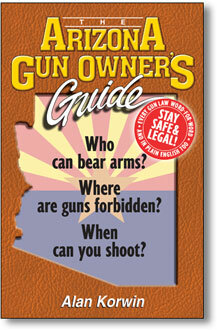 Arizona is now a reveal and relinquish state: You must tell if you are armed if officially asked by police during a proper stop, and you must relinquish your arms if asked, a very dangerous proposition according to experts, handling loaded guns in public countless times a day, from innocent people. The point of that is what exactly? The Arizona Gun Safety Program, the high-school marksmanship one-credit course has been improved a bit -- now if we can only get more teachers and schools on it. Frivolous lawsuits got another nail in the coffin, but more is needed and coming in a ballot proposition in Nov. 2012. The Firearm Freedom Act, a challenge to the federal government's abuse of the Commerce Clause, coordinated through multiple states, legal cases are being built. This law is not a grant of permission to build a gun in your basement, it is a legal test. We'll no more after the cases run. It could launch tremendous new business in the state, if we can just get government out of the way. The preamble to the statute is a testament to our rights, wonderful reading, full text included. Generally, forfeited weapons can't be destroyed, they must be sold back to the public, unless a rightful owner can be identified. One secret for rights restoration involves the definition of a prohibited possessor, described. And that's just Chapter One! "Every gun law in the state, word-for-word and in plain English." Save your old editions -- they're a piece of history.